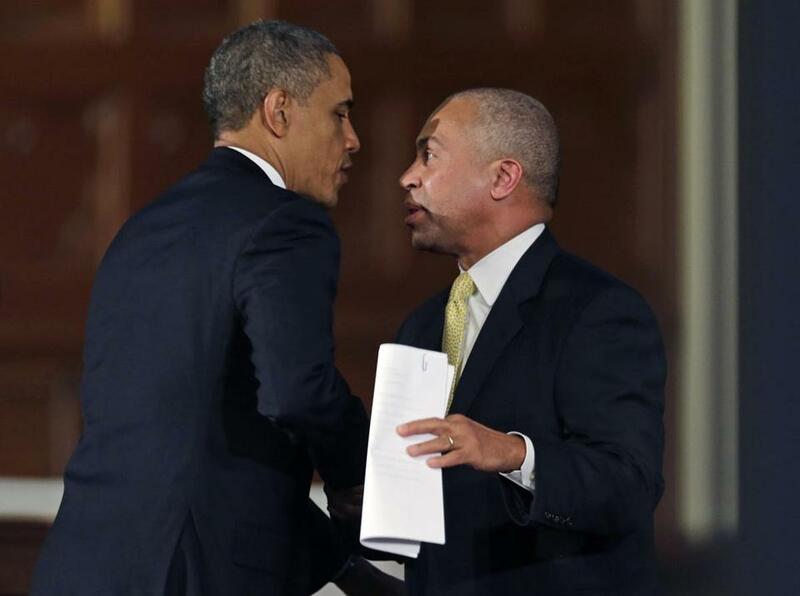 President Obama shook hands with Governor Deval Patrick after Patrick’s speech. Remarks by Governor Patrick to the interfaith service following the Boston Marathon attacks, as prepared for delivery. I’m thankful for the medical professionals -- from the doctors and trauma nurses to the housekeeping staff, to the surgeon who finished the marathon and kept on running to his operating room -- all of whom performed at their very best. I’m thankful for those who have given blood to the hospitals, money to the OneFund, and prayers and messages of consolation and encouragement from all over the world. How very strange that the cowardice unleashed on us should come on Marathon day, on Patriots’ Day, a day that marks both the unofficial end of our long winter hibernation and the first battle of the American Revolution. And just as we are taught at times like this not to lose touch with our spiritual faith, let us also not lose touch with our civic faith. An attack on a civic ritual like the Marathon, especially on Patriots’ Day, is an attack on those values. And just as we cannot permit darkness and hate to triumph over our spiritual faith, so we must not permit darkness and hate to triumph over our civic faith. That cannot happen. And it will not. Fellow citizens, I am honored and humbled to welcome our friend, our leader, and our commander in chief, the President of the United States.